Hi! Finley’s mom here. As you learned in the post A Betta Fish Mom’s First Mistake, I overfed Finley shortly after getting him. Of course, I immediately searched online to find out how to help him. One of the common solutions was to offer him a cooked pea. Peas are a high-fiber food, so that would help him to digest all the food in his big belly. Unfortunately, the places I learned about this solution from (sorry, I don’t remember where exactly) all recommended either dropping the pea in the water (and fishing out the leftovers later) or holding the pea with tweezers while your fish eats. In case you’re wondering, tightly holding a pea with tweezers and chasing your fish around the tank with it to try to get him to eat is not exactly an ideal situation. So, I came up with a new solution: the DIY Pea-Holder. Step 1: Cut a love piece of plastic sewing canvas. I used the same kind that I used for Finley’s DIY Tank Lid. It is about $3 at Walmart. This piece is 36 holes long and 4 holes tall. Step 2: Bend the piece in half to put the small sides together without actually folding it on a crease. 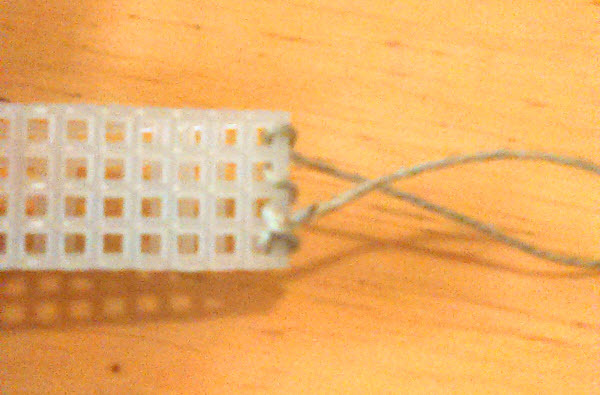 Thread a string through the holes along the small sides to tie them together. If the pea-holder is actually going all the way in the water, it would be better to use fishing line. At the time, I just had some natural help string, and I tie the top of the pea-holder ore onto the tank lid, so the string isn’t in the water. 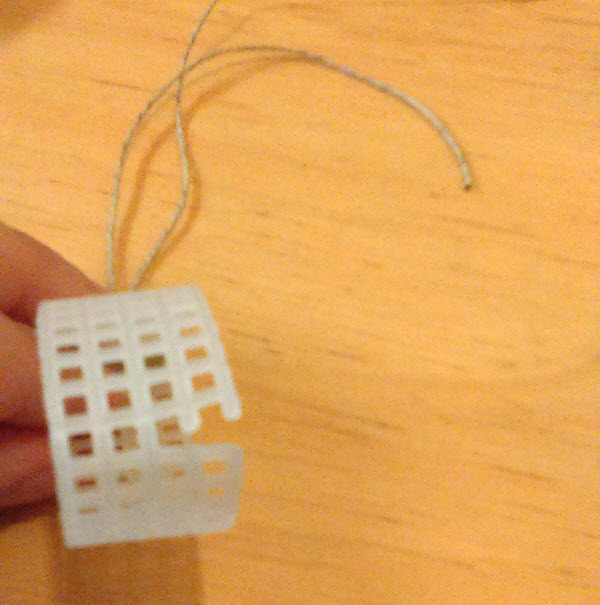 For the holes on either end, put the end of the string back through the loop before pulling the loop tight. Step 3: On the bend of the pea holder, cut two rows open. Step 4: Get a cooked pea. At Whole Foods, cooked peas are usually available in the food bar, so I just get a little side cup of them and pick out a good one. 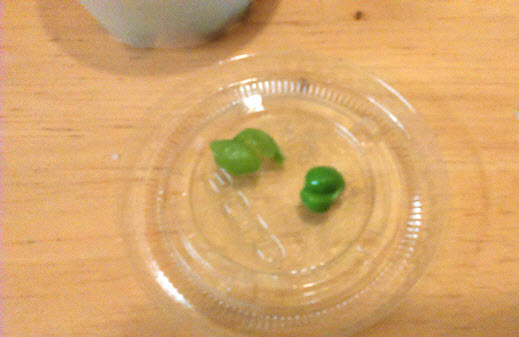 Depending on how much the pea has been cooked, either remove the outer casing entirely, or just pinch a hole out of the outer casing to expose the mushy pea inside while still keeping it contained enough for the pea-holder to grasp it. If you would like to cook a pea at home, NippyFish.net has a helpful article explaining how to do that here. Step 5: Wedge the pea in the cut area of the pea-holder. If the pea is still solid enough that the entire casing can be removed, pinch it in a couple spots to make it easier for your fish to eat. Finley usually eats more when the pea is mushier (and the casing needs to stay on it), but he will still grab a piece off the slightly less cooked peas as well. Step 6: Hang the pea holder in an open area of your fish’s tank. This is easy to do with Finley’s DIY Tank Lid since it’s made of the same plastic canvas material, but for a standard screen lid, you may be able to thread a fishing like through that screen. If not, you could tape the free ends of the strings to a stick (or something stick-like) and lay the stick over the top of the tank. As you can see, there’s no fooling Finley. He knew right away that the edamame was NOT a pea. #ImposterPea He flared at the edameme for a couple minutes, but never took a bite out of it. As he was so clearly upset about it, I removed the edamame after only a couple minutes. The pea, however, I will leave in his tank for a couple hours sometimes. He does go back to it a couple times and will swim through the hoop a few times as well. Just make sure that you don’t leave the pea in the water so long that it dissolves in order to maintain the water quality. Important safety note: whenever you get or make something for a betta fish, you should always check it for any sharp spots that could damage your betta’s fins. If there are any pokey spots on the pea-holder, such as on the top corners if you submerge the whole thing under water, file them gently with a nail file and rinse the pea-holder off to remove the shavings.